For the airport with the ICAO code KMNV, see Monroe County Airport (Tennessee). KMNV (1400 AM) is a radio station in the Twin Cities area of Minnesota that airs a Spanish-language music and entertainment format. KMNV's studios are located on 27th Avenue South and East Lake Street in Minneapolis. Its transmitter is located near the Mississippi River in St. Paul. The station began as WMIN in the summer of 1936, when Saint Paul furniture retailer Edward Hoffman began broadcasting at 1370 kHz. WMIN was reassigned to the 1400 kHz frequency in 1941 when an international treaty (NARBA) was negotiated to reduce interference between American radio stations and those from other regions. Noted jazz announcer Leigh Kamman started his career in broadcasting at the station around this time. For many years, the station's transmitter and single tower have enjoyed an enviable location in the center of the metro area. Since at least the late 1970s/early 1980s, if not earlier, KMNV's technical plant has been located within a block of the city limits separating Minneapolis and St. Paul just east of the Mississippi River at 611 West Frontenac Place in St. Paul. It is plainly visible to travelers on Interstate Highway 94. The studios, at least in the 1970s and 1980s, were also located at this address. WMIN set up a sister station, WMIN-FM at 99.5 MHz in 1945, which operated until being purchased by the owners of AM station WLOL and given those call letters in 1956. WMIN would eventually sign on another sister station, at 102.1 FM. 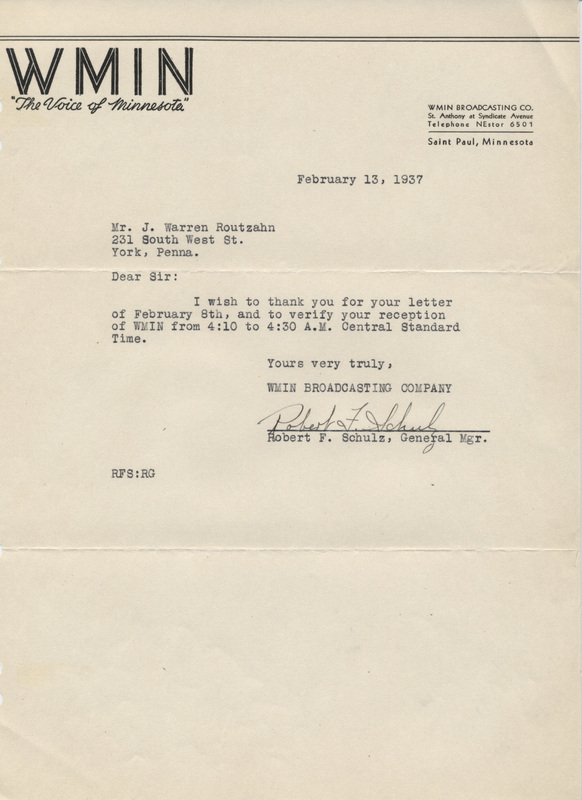 In addition to FM, WMIN went into television as well, applying for a television license in 1952 for channel 11. WTCN radio had also applied for this frequency, so the stations arranged to divide the broadcast day between the two stations. The stations soon merged as WTCN, which eventually became today's KARE. In 1954, the call sign for 1400 AM briefly changed to WMNS, reflecting a change to a full service format of music, news and sports. The format remained, but the station returned to being WMIN later that year. As WDGY, WLOL and KDWB enjoyed success playing Top 40 music in the late 1950s, WMIN joined the fray. In July 1962, WMIN adopted an all-news format, adopting the KTWN call letters the following November. They were changed back to WMIN the following August. In 1967, after dabbling with country music for the past three years, they took on the format full-time. The station changed its call sign again in 1972 to KEEY, to match that of its FM sister station, and installed a soft rock format separate of the FM, which aired beautiful music. The AM station would eventually air a beautiful music format identical to its FM counterpart by 1981. In 1984, the two stations were split up as KEEY-FM became the sister station of WDGY and the AM station struck out on its own. The call letters were changed to KLBB in February 1982, with a staff consisting of many former employees of WCCO Radio. They aired a full-service format consisting of talk, big band and MOR music. Cargill Communications purchased KLBB in 1993, along with KBCW (1470 AM), WTCX-FM (105.1 FM) and WLOL-FM (105.3) for the basis of a proposed alternative rock station, soon to become known as "REV105". The new owners were uncomfortable with dropping the much-loved MOR format of KLBB, so they kept it, updated the music, imaging, promotion and logo of the station, and simulcast KLBB's programming on 1470 AM Brooklyn Park to improve signal coverage to the north and west. The WLOL call letters (well known in the market from their original homes on 1330 AM and 99.5 FM) were retained by the company and moved from 105.3 FM to 1470. KLBB, along with WLOL, eventually separated once again from their FM sisters. James and Susan Cargill, who had also acquired a third FM station at 105.7, sold all three of the FM stations that made up REV105 to ABC Radio, owners of KQRS-FM and KEGE. In 1999, the Cargills donated both KLBB and WLOL (soon to be renamed KLBP) to Minnesota Public Radio, where the two frequencies became part of the for-profit Minnesota News Network (MNN). The stations continued the standards format. In 2004, MPR sold off MNN and the statewide network's flagship AM station, WMNN, but retained KLBB and KLBP for the time being. By now, the "Club 14" simulcast was carrying a mix of local personalities and the "Music Of Your Life" radio network. The two stations were operated as The KLBB Company, a for-profit subsidiary of the Greenspring Company, which, like MPR, were under the umbrella of the American Public Media Group. MPR announced on May 25, 2005, that it had reached an agreement to sell both KLBB and KLBP to Davidson Media Group, a New York-based broadcaster specializing in multi-cultural, community focused formats. Thereafter, KLBB acquired a Spanish-language format, while the format on KLBP remained MOR until July 17, 2006, when it switched to a gospel music format with the KZTG (later KRJJ) call letters. The sale of both stations was approved by the FCC on July 25, 2005, with Davidson taking control on September 7. KLBB finally transitioned to its long-promised Spanish-language format on November 4, 2005, leaving the Adult Standards/Big Band format on sister station KLBP and bringing to an end the long-time Club 14 simulcast. The KMNV call letters were introduced to AM 1400 on December 16, 2005, just months after its switch to Regional Mexican, while the KLBB call letters moved to sister station AM 1470. The station also airs games of the Minnesota Twins baseball team. Davidson Media sold KMNV and sister station KMNQ to Santamaria Broadcasting, Inc. effective May 5, 2016, at a purchase price of $1.2 million. KMNV and KMNQ added an FM translator on 95.7 FM in early 2017. It broadcasts from the KMNV tower. Following 1470's switch to gospel music, the KLBB call letters and much of its programming were picked up by Stillwater-based WMGT (1220 AM) on July 25, 2006. 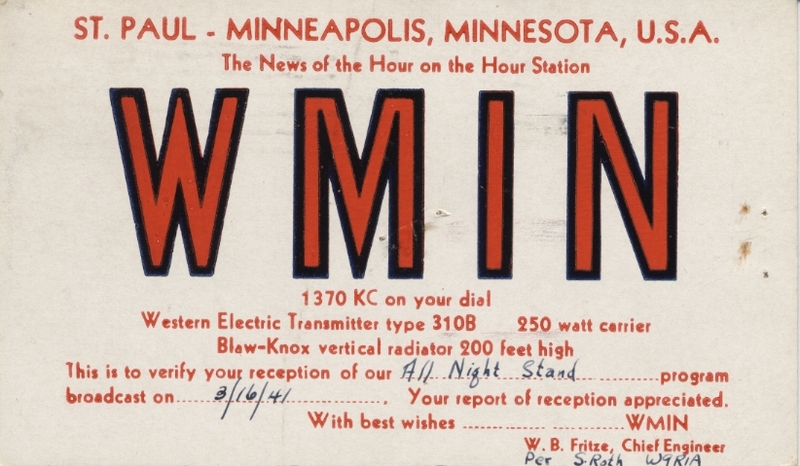 The former WMIN call sign was located for many years at 1030 AM, then at 740 AM in the Twin Cities until the call sign was picked up by AM 1010 in Sauk Rapids, Minnesota. KEEY-FM continues with those call letters at 102.1 FM, with a country format. This page was last edited on 29 November 2018, at 22:03 (UTC).